Caledonian Kitty: 50 #Blogmas post ideas! It doesn't seem that long ago that some of us were planning our Blogtober posts but here we are thinking and planning our Blogmas posts which I have to say I'm looking forward to doing. I love this time of year and never tire of thinking and talking about festive things. This year I won't be doing every single day of December but I will be doing 24 days with my last post obviously on Christmas eve, after that I will be in a festive food coma and off social media for a few days. I think it's good to take a break from social media around Christmas and really give yourself time with your loved ones or to treat yourself. If you can schedule your blog posts and tweets it gives you a chance to take a break but still know that your posts are being shared and promoted. 2) Favourite Christmas songs of all time. 3) Worst Christmas present you've ever received. 5) My Christmas decoration haul. 6) My top 5 favourite Christmas movies. 7) My top 10 festive Netflix recommendations. 8) Worst or most embarrassing Christmas memory. 9) Christmas outfit look book. 11) Stocking filler gift guide. 12) Come Christmas shopping with me. 13) Top 5 places online for the best Christmas deals. 14) What I love about Christmas. 15) My favourite Christmas stationery. 16) Vegetarian Christmas Dinner ideas. 17) Vegan Christmas Dinner ideas. 20) My favourite festive drinks. 21) What I got my relatives/friends for Christmas. 22) My favourite festive candles. 23) How to bake Christmas cookies (cupcakes, whichever goodies you want to share the recipe for). 24) Review of a Christmas advent calendar. 28) My plans for New Year's eve. 29) My hopes for 2019. 30) What 2018 taught me. 31) My Christmas shopping routine. 32) My favourite Christmas shopping experience. 33) My worst Christmas shopping experience. 34) My favourite Christmas adverts (Could be recent or from childhood ie: Coca cola adverts lol). 35) Bloggers/Vloggers I've been loving in 2018. 36) A thank you post to the bloggers who have supported you over the past year. 37) My favourite Christmas ranges (ie: Lush etc). 38) My favourite posts (make a list of the posts that you've enjoyed writing this year). 39) My most popular posts of the year (List as many as you want of the posts which have been a big hit on your blog). 40) My favourite festive products. 41) How to make the perfect festive drink. 42) How I plan for Christmas. 43) How I decorate my Christmas tree. 44) 5 things I would change about Christmas. 45) 5 Christmas songs that drive me mad. 46) Christmas self care routine. 47) Advice for fellow bloggers who are not looking forward to Christmas or New year. 48) How I manage my anxiety over Christmas and New Year. 49) My top 5 favourite festive lipsticks. 50) Christmas home ware wish list. And there you have it! 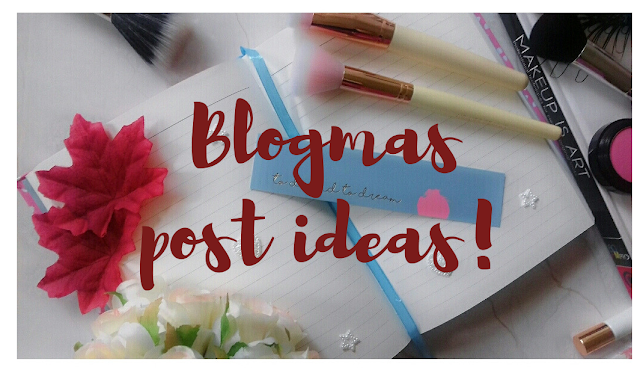 I managed to come up with 50 ideas to maybe help you out if you're in the middle of planning Blogmas. If you have written a post with some ideas leave a link or comment below. I'm looking forward to reading all the Blogmas posts.